Some last minute gifts.....Altoid tins+clear pebbles=cool magnets! I have friends at work that save Altoid tins for me and I thought these would make some great gifts for them as well as other friends. It's quick, easy, and relatively inexpensive. Supplies: Clear pebbles ( I used 1" pebbles from the $1 Tree for a $1 bag, and 3/4" pebbles from Hobby Lobby that were $2.77 for a 2 lb. bag. ), Zip Dry Paper Glue, circle punches, scissors, pen, adhesive, and magnets (super/extra strong), Super Glue. For my tins I used some old maps and a 1946 Mademoiselle magazine I found this Summer and was just waiting for the right time to use it!! I covered the tin in the map and I used Graphic 45 paper to go with the vintage magazine pictures. First, using a punch or just tracing around your clear circle pebble cut out your image. Once your image is cut out apply a small amount of Zip Dry glue to the pictures and place your pebble over top. Now press hard to get the bubbles out and to allow all the adhesive to be spread evenly. Let dry. Cut off any excess with scissors. One of the coolest ideas....EVER!!! I love this site and their awesome photography skills! They made this heart using photos from their Fuji Instax mini camera! I would like to own the Fuji Instax 200 wide but will have to wait until the price comes down a bit! Isn't it just the coolest idea ever!!! I couldn't be more proud! Every year the Combined Efforts Drama group puts on a show featuring regular ed kids and special ed kids. These are some clips of my son singing in that show. I am so proud of him. He is a man of few spoken words but my goodness how he can SING! Thanks to listening to Bing Crosby all year long on our way to school....Jordan had this song mastered!! Enjoy....we did! (be sure to turn off my Christmas music on the right hand side so you can hear the video! Just click the play/pause button on the pink Nano player) Thanks to all the staff and kids for making this such a wonderful and moving experience! All you will need are some 8x8 page protectors from Zutter and a little bit of fabric! Go here for the full tutorial! This banner is so versatile in that you can switch out the page protector inserts and change what the banner says any time you want! This is a project that can be used again and again for so many celebrations and holidays! I have a couple of projects to share. 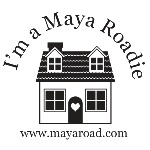 You can check them out at the Bind-it-all site and the Maya Road Design Team site! Enjoy your weekend and the last few days of shopping!! I love fabric yo-yos and here is a cute and easy little project to make a yo-yo Christmas tree! I used yo-yo templates from Clover! I love these little templates...so easy and a fast way to make yo-yos. I used three different sizes for this project. I used a scrap piece of thin upholstery fabric for this tree. Each yo-yo was stuffed with cotton batting to make it a bit fuller looking. After creating the yo-yos I simply stacked them on top of each other (2 large, 2 medium, 1 small) and adhered them with Fabric-tac(the wondrous all purpose glue I was turned onto by Katie Watson) and then decorated the tree withMaya Road's jewel pins and pearl pins. Simply push the pins right into your stuffed yo-yo. You may have to shorten the pins if needed. My Facebook account was hacked!! The girls at Bind-it-all have got some for you! Here are the links for the DT submissions and here are my submissions! My page protector banner tutorial will be up on the Zutter Zisters Blog on the the 20th and the countdown calendar on the 18th! Please also visit here for even more views of the projects done for this holiday season! The Reminisce girls are also posting some great projects too! Check them out here! Last Christmas I made and shared a tutorial on this fun photo strip Christmas ornament! Today I would like to share a tutorial on making a photo strip garland. Simple and easy!! In Photo Shop I set my template as a 4x6 photo. I shrunk the two photo I used to 1"x1.5". This will give you 4 strips with four photos per strip. Next, cut those strips and attach them to some fun cardstock. I chose Vintage Plaid by Basic Grey! Cut these strips out. Now remember those garlands you made in kindergarten? Well, that's what I did here! I just made a loop, stapled it and continue with the rest of my strips until I had a garland! A great way to make a personalized garland for your family! !